"In our paper we focus on how design prototypes can foster communications in organizations that deal with the development of innovations. We distinguish the impact of prototypes between two different organizational levels; we first conduct the impact of prototypes at the level of organizational design teams that develop ideas and concepts for solutions. We then focus on the impact of prototypes on the level of organizational teams and departments that have not been part of the initial design phase but are responsible for further developments in the innovation process, e.g. production, financing, and marketing. Previous research has indicated that prototypes have a significant influence on both organizational levels. Prototypes, in the best cases, can become so–called boundary objects between different domains and stakeholders and may deliver positive effects within the innovation process. However, the successful management of stakeholders in this context remains highly challenging. In this paper we want to address these difficulties as well as the current state of research in this field. We propose that a prototype does not only stand for an important design technique but should moreover be regarded as a management tool that can be integrated into a structured dialogue between stakeholders. We provide first insights on what a structured dialogue, based on prototypes, can mean and what it thereby should imply. We will synthesize prior research findings and begin to develop a concept on how to utilize prototypes as boundary objects from a management perspective." "Over the past twenty–five years, people have weathered dramatic changes in their experience of time, space, matter, and identity. Individuals cope daily with a multitude of changes in scale and pace – working across several time zones, travelling with relative ease between satellite maps and nanoscale images, and being inundated with information. Adaptability is an ancestral distinction of intelligence, but today's instant variations in rhythm call for something stronger: elasticity, the product of adaptability plus acceleration. 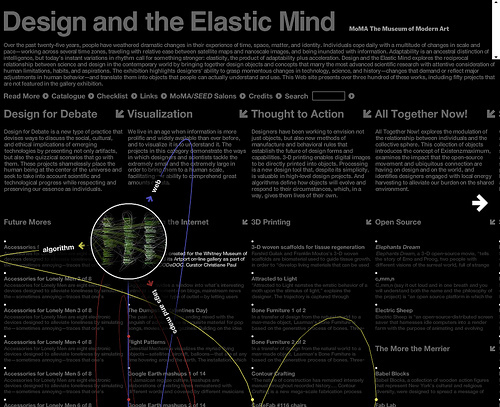 Design and the Elastic Mind explores the reciprocal relationship between science and design in the contemporary world by bringing together design objects and concepts that marry the most advanced scientific research with attentive consideration of human limitations, habits, and aspirations. The exhibition highlights designers' ability to grasp momentous changes in technology, science, and history – changes that demand or reflect major adjustments in human behaviour – and translate them into objects that people can actually understand and use. This Web site presents over three hundred of these works, including fifty projects that are not featured in the gallery exhibition."